M275 | 918 m. | 3012 ft. The second hike of 2016 was scheduled for a set of two Munros which I had visited twice before on each occasion bagging one of them. I had climbed one with Alex (Sron) and the other one with Mike (Meall). Today Frank and I were to combine them in one hike from the Cam Bealach (or at least Frank had to combine them since he still needed the ticks in his list). From the parking just before the farm in Kilfinnan we followed the usual approach on the forest road, passing a few holiday homes or huts and then took the upper branch of the road through the dense fir plantation. It was an overcast day and occasionally a few drops of rain fell from the clouds. When three or three and a half kilometres were behind us we left the road took the good path branching off to the right and started the climb beside the Allt Glas-Dhoire. This path is steep at first but soon after you leave the forest the gradient eases. The continuation up the Cam Bhealach is quite scenic since both Sean Mheall to the north and Beall Dubh to the south of the glen hold interest for the wandering eye with their rocky faces and gullies. We made good progress and after maybe six kilometres were covered we reached the bealach between the two hills. Here I decided that one Munro would be enough for today (no summit views) and Frank set of towards Sron aíChoire Ghairbh climbing the very well-engineered stalkers (?) path which leads almost all the way to the summit ridge and level summit of the Munro. I lay down in a comfortable spot close to the bealach and dozed for maybe 40 minutes. Then another walker reached the bealach also from the Loch Lochy side and we chatted a bit. Soon Frank was back, we took a short break and then left our rucksacks in the vicinity of the bealach. The continuation to Meall na Teanga involved a steepish climb up the northwest flank of Meall Dubh, a more flattish section cross the connecting at the head of Coire Leacachain, another pull this time up the north ridge of Meall na Teanga and a final ridge walk in the clouds to the 917m summit. At the cairn we took a break and enjoyed the views of absolutely nothing: The clouds enshrined us. Just now and then we had glimpse of some rays of sunshine from above our heads. The weather forecast had predicted a better second half of the day on the west coast so Mike and I decided to drive to Fort William (from Crianlarich where we had spent the night) and to try our luck on one of the two Munros to the north-west of Loch Lochy: Meall na Teanga. Having parked on the Forrestry Commission’s car park at the end of Glenn Cia-Aig we set out in full rain gear (to deter the rain from falling) up the excellent foot path and track to the end of the fir plantations in that glen. From there we climbed due east up the steep grassy back of Meall Odhar to reach the ridge at point 871m. Partial sunshine, a strong wind and many clouds accompanied us from Meall Odhar to Meall Coire Lochain and finally, after a steep descent and more comfortable rise, to Meall na Teanga where we rested engulfed in clouds which from time to time gave way to brillant sunshine. Good views of Loch Lochy and Loch Linnhe with tantalizing reflections of sunlight on the latter recompensated for the long slog up Meall Odhar. Finally we trodded back the way we had come and took in great views of Loch Linnhe and the Ben Nevis area. The descent down to Glenn Cia-Aig over grass and moss was very pleasant indeed. The rest was a stroll back to the car. On our drive to Fort William we took a good look at Ben Nevis, Aonach Mhor, Carn Mor Dearg and the Grey Corries all of which were well visible from the Commando Memorial. The day had become better and better. Description Sron a' Choire Ghairbh and Meall na Teanga rise steeply above the north-west side of Loch Lochy, their lower slopes being densely forested along much of the length of the loch. The two mountains are well seen from the A82 road on the opposite side of the loch, and from there they appear to be rather steep and inaccessible, except for the path which climbs to the pass, the Cam Bhealach, between them. Sron a' Choire Ghairbh on the north side of this pass is the highest point of a long level ridge which encloses the head of Coire Glas. The west slopes of this ridge drop towards the remote head of Gleann Cia-aig. 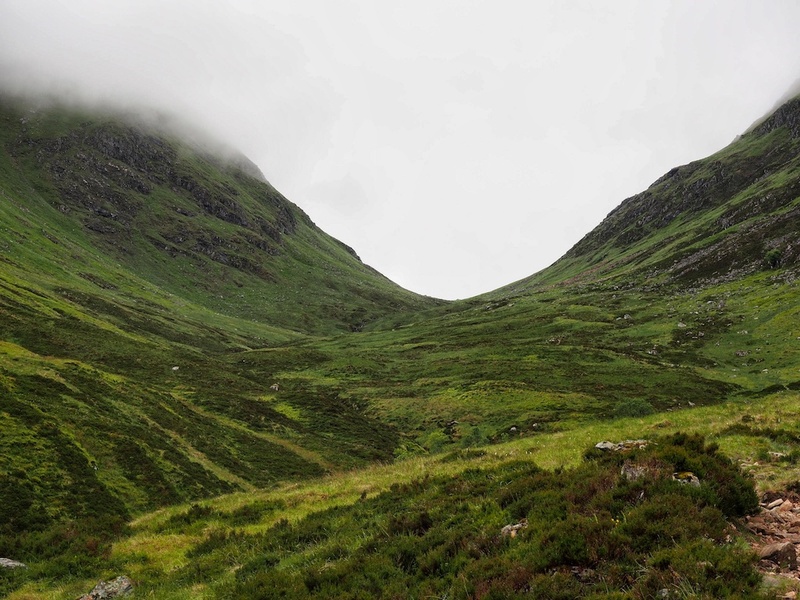 On the south side of the Cam Bhealach, Meall na Teanga is the highest of a group of three steep hills, the others being Meall Dubh and Meall Coire Lochain.The ascent of both Sron a' Choire Ghairbh and Meall na Teanga can be made from the highest point of the path which goes over the Cam Bhealach between Loch Lochy and Gleann Cia-aig. From there a stalker's path zigzags steeply uphill on the north side of the pass and ends below the ridge not far from the summit of Sron a' Choire Ghairbh. On the south side of the pass the route to Meall na Teanga starts with a traverse below the scree-covered west side of Meall Dubh to reach the north ridge of Meall na Teanga. If returning to Gleann Cia-aig from Meall na Teanga, the quickest way is to traverse to Meall Coire Lochain and descend west along the ridge over Meall Odhar.